As expected, the opening of the exhibit in New York of caskets found in Jerusalem, sparked much debate and anger throughout the Christian world. The caskets were reported to hold the remains of Jesus and His immediate family. This, according to the producers of a documentary film soon to be aired on television. Statements from prominent archeologists declared that this was nothing but a cheap publicity stunt and a scam. This type of scam should not go unpunished, it is an insult to the belief of millions of people, some way should be found to bring these liars to justice. The following is a report from today’s New York Times on this situation, be sure to click on the links as well…..
With no film in the running this year, director James Cameron seems set on muffling the post-Oscar rhapsodizing by loosing the publicity hounds on his latest project, which strikes at the foundations of Christianity and already has Church authorities upset. It looks like things really got rolling, buzz-wise, with a TIME magazine blog whisper on Friday, which outlined details on 90-minute documentary in which Mr. Cameron, along with journalist Simcha Jacobovici, say they have uncovered the burial cave of Jesus and his family — along with enough DNA evidence to establish, they say, that Jesus wasn’t resurrected and that Jesus sired a son with Mary Magdelene. The story was picked up over the weekend, and although the documentary will not air for another month (on the Discovery Channel), and an accompanying book co-authored by Mr. Jacobovici, “The Jesus Family Tomb,” is not quite shipping from Amazon.com yet, the condemnations have already started to fly. Meanwhile, Mr. Cameron is scheduled to hold a press conference at 11:00 a.m. in New York, at which he will reportedly unveil the burial boxes that he and his colleague say once contained the bones of Jesus. “Over the years, Hollywood has attacked and mocked Christianity, providing only negative portrayals of people of faith. It has produced films that undermine moral culture. Hollywood’s production of ‘The Da Vinci Code’ sensationalized a conspiracy theory that the Catholic Church engaged in a cover up of the real story of Jesus operating in the manner of a crime syndicate. “According to Cameron, his film is no mere speculation, but historical fact. By claiming the remains of Jesus returned to dust along with other members of his family, the Hollywood filmmaker is denying the divinity of the Son of God and his victory over death. Cameron clearly intended to drive a stake into the heart of Christianity, since without the Resurrection, Jesus was only a mortal man. Clearly, the press conference — and the next month or so — should be interesting. Early reports indicate that while the evidence the filmmaker and the journalist have brought to the table are by no means definitive, it is compelling. 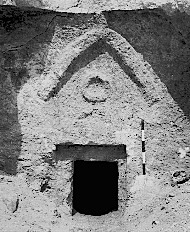 The ossuaries — or burial boxes that purportedly contain the bones of Jesus and his family — were discovered in a 2,000-year-old cave in 1980, during excavation for a housing project south of Jerusalem. They are now in the stewardship of the Israel Antiquities Authority in Bet Shemesh, outside Jerusalem. The boxes bear the names: Yeshua [Jesus] bar Yosef [son of Joseph]; Maria [the Latin version of Miriam, which is the English Mary]; Matia [the Hebrew equivalent of Matthew, a name common in the lineage of both Mary and Joseph]; Yose [the Gospel of Mark refers to Yose as a brother of Jesus]; Yehuda bar Yeshua, or Judah, son of Jesus; and in Greek, Mariamne e mara, meaning ‘Mariamne, known as the master.’ According to Harvard professor François Bovon, interviewed in the film, Mariamne was Mary Magdalene’s real name. The bones contained in the boxes have long since been reburied, according to Jewish custom, in unmarked graves in Israel. If the evidence adduced is correct, the bone boxes, and microscopic remains of DNA still contained inside, would constitute the first archaeological evidence of the existence of the Christian savior and his family. Tests on mitochondrial DNA obtained from the Jesus and Mariamne boxes and conducted at Lakehead University’s Paleo-DNA laboratory in Thunder Bay, show conclusively that the two individuals were not maternally related. According to Carney Matheson, head of the lab, this likely means they were related by marriage. The Globe and Mail also notes that “nothing in the film or book directly challenges traditional Christian dogma regarding the resurrection,” but the concept of the ascension, which holds that Jesus ascended to heaven in both body and spirit 40 days after the resurrection, could be challenged. If DNA research were to link Jesus and “his brother” Yose with Mary, the newspaper noted, it would undermine he concept of the virgin birth, which sits at the bedrock of Christianity. Scholarly analysis of the documentary and the book are still forthcoming, of course — and skeptics have already turned up on CNN noting that the names on the boxes were rather common at the time, and are therefore thin evidence of anything. It’s interesting that that particular ossuarie is not part of this display. So, I am awaiting the reaction from the Evangelical Christian Zionists on this matter. THAT should be interesting. Robin, I am sure that the ‘Christian’ zionists will react in the same way as any other zionist, they will whitewash the stoy and lie about it. The, they will call anyone that is upset by the situation an anti Semite…. they are themselves so brainwashed by Israeli politics that their actions are very predictable.